We've been recording global surface temperatures since 1880, the beginning of what meteorologists call the modern record. In that time, worldwide temperatures have been on the rise. 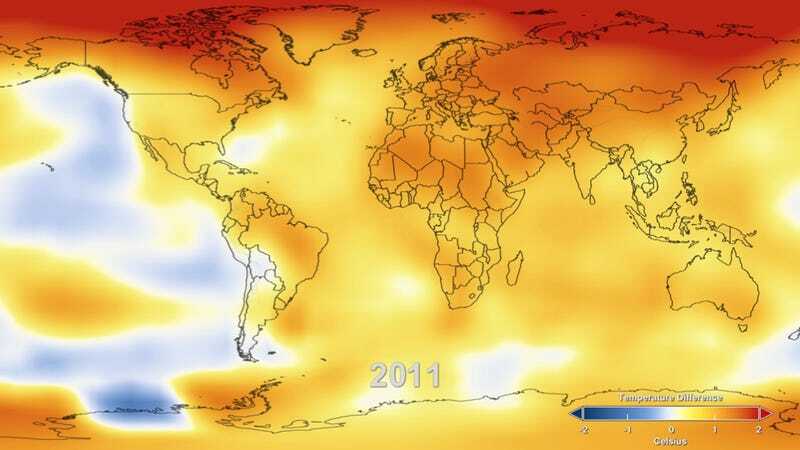 Now, NASA scientists are reporting that the global average surface temperature in 2011 was the ninth warmest that we've ever recorded. So what's the big deal? In the last 132 years, nine of the ten warmest on record have occurred in the last eleven years. Numbers like this can really benefit from visual aids, and that's where this video from NASA comes in. This clip, which depicts global temperature data collected by NASA's Goddard Institute for Space Studies, does a good job of illustrating these long-term changes in temperature (and the not-so-long-term changes seen from the late 70s onward). The colors you see pulsing across the map indicate deviations from an average temperature determined during a baseline period spanning the years 1951—1980. Warmer colors like yellow and red indicate temperatures higher than the baseline, while cooler, blue colors correspond to temperatures below the baseline. As a point of reference, the swings in temperature that you see represented here only differ by a few degrees, but remember: on a global scale, a few degrees make for very, very dramatic changes in climate. You all know that, of course... but sometimes, it really helps to see it.